My earliest memories of Hakka cooking date back to my childhood spent in Ipoh, Malaysia where there is a large Hakka population. Hakka literally means "guest people"(客家) and is a rather apt description. Sometimes also known as the nomads, pioneers or travellers, the Hakka has no homeland of their own. Unlike most Chinese subgroups who can be defined by a particular province in China, the Hakka travelled all over China and take roots wherever they landed. They are known to be a resilient and extremely hardworking community. Part of my family is Hakka and this particular cuisine also played an important part in my growing up. So what is Hakka food? It is what I would describe as Chinese soul food. It's humble, hearty and strongly flavoured. It is uncomplicated and sometimes seen as peasant food. Due to this reason, it is not often seen outside a traditional Hakka household. 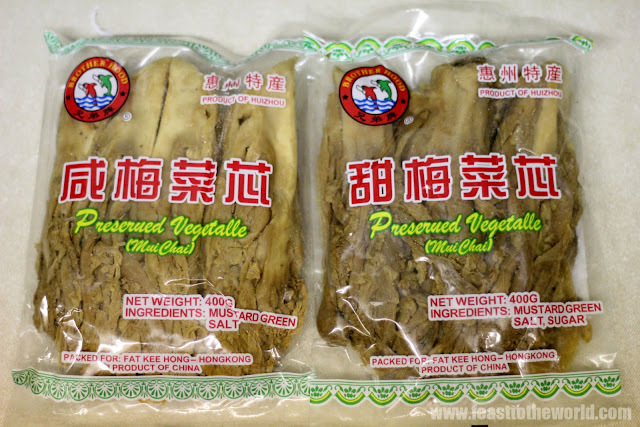 There are however, a few exceptions that managed to make appearances on restaurant menu such as Salt baked chicken or Yam Kuk Gai (盐焗鸡) and also this classic, Moi Choi Kiu Ngiuk or more commonly known by the Cantonese name Mui Choy Kau Yuk 梅菜扣肉. 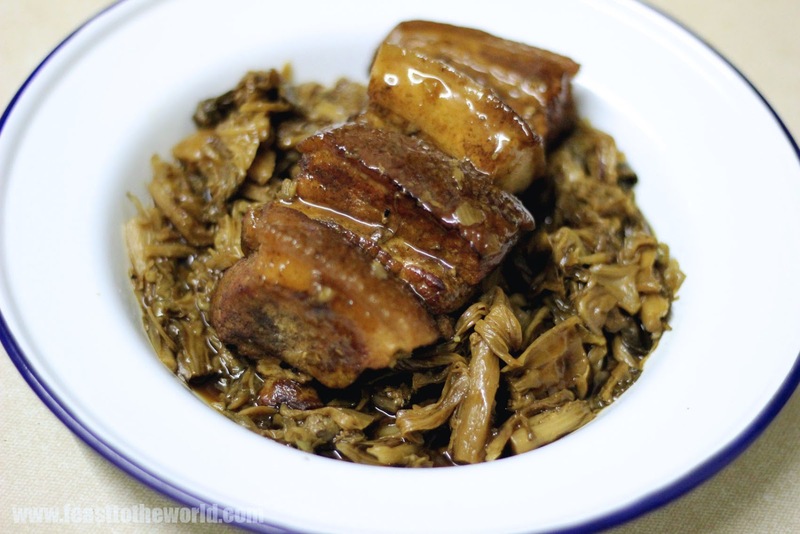 This dish paired two traditional Hakka ingredients, the much beloved pork belly (also known as five -flower pork) and the preserved mustard greens. Admittedly, it might not win the best looking dish of the year award and will hardly be able to compete with all the Michelin starred refined plating out there but what this humble dish lacks in appearance, it sure hell makes up in the taste department. 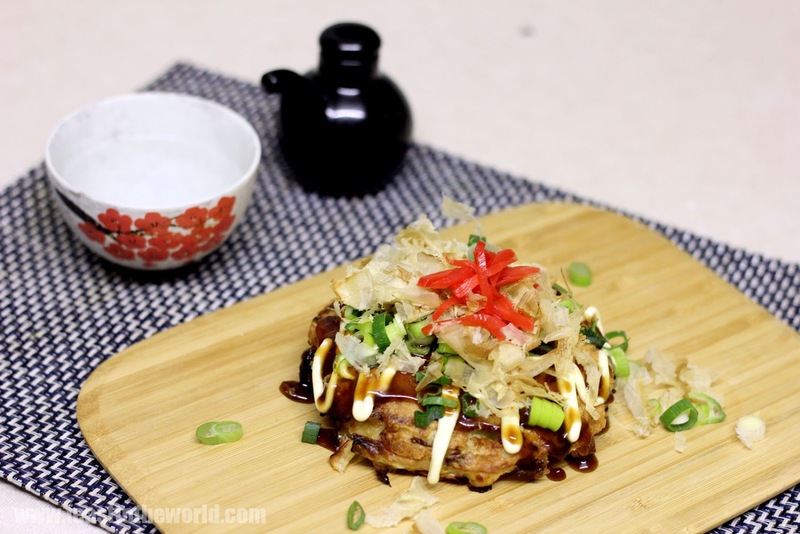 The sweet and salty flavours, combined with a mouth watering soft meat and rich, umami laden sauce is just the perfect comfort food anyone will ever need. 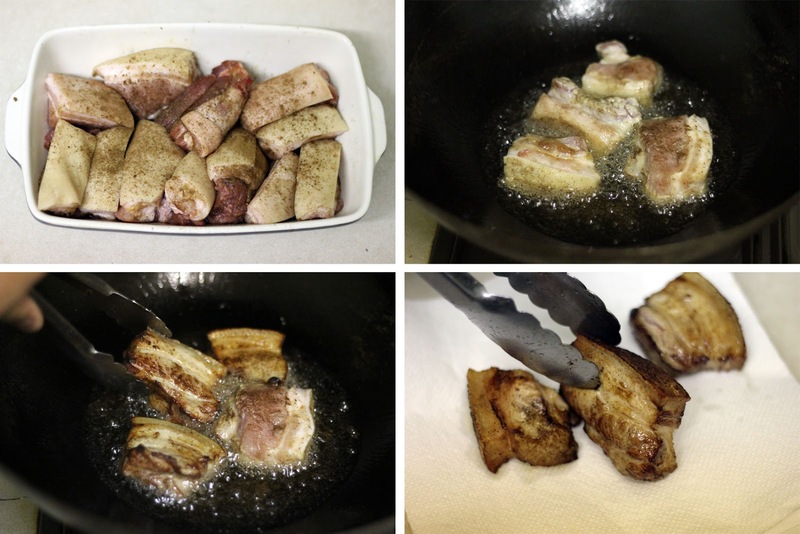 Traditionally, the pork belly slices are marinated, fried, before arranged skin side down over the bottom of a dish. The preserved greens and sauce are then layered over this and steamed for hours. This is then inverted over a serving plate, thus the name kiu ngiuk or 'turn over meat'. These days, many adopted the Cantonese way of braising which is less laborious as it did away with need to constantly topping up the steamer with boiling water. Although I personally still prefer the steaming as the moist heat slowly cook and render the pork to succulent softness. Prepare the pork. 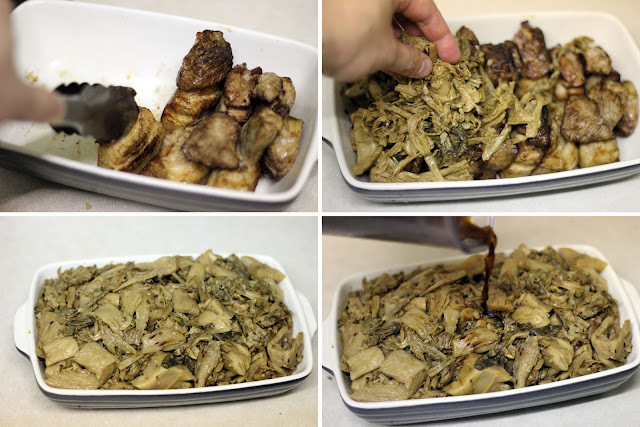 In a small bowl, mix the salt, sugar and five spice powder and rub the pork thoroughly with this mixture. Set aside to marinate for at least 2 hours or preferably overnight for the flavours to permeate the meat. Heat up the oil in a wok/pan over medium heat, roughly 190ºC. Fry the pork pieces until lightly browned. You don't have to completely cook the pork at this stage. Remove and drain on some kitchen paper. Do this in batches so you don't risk overcrowding. Chop the mustard greens into 2cm pieces and thoroughly wash them to rid of any grits. Place in a large bowl and fill with hot water. 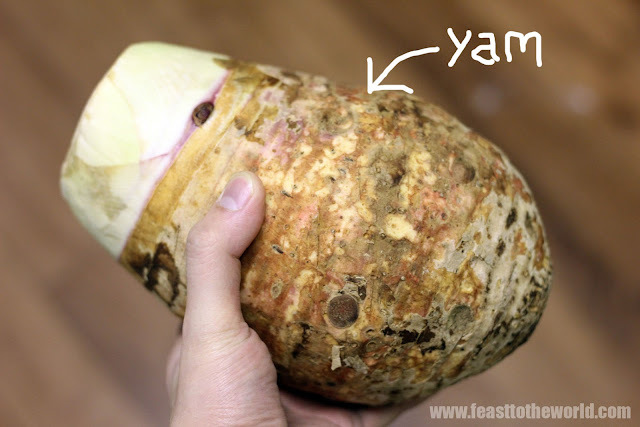 Leave for 30-45 minutes, until the thick stems are slightly soften. Drain, rinse and squeeze out any excess water. Heat up the wok over medium heat until smoking. Add the oil and when smoking, stir fry the shallots, garlic and ginger for 1 minute, until fragrant. Add the preserve greens and stir fry until they are almost dry and thoroughly coated. Remove and set aside. Combined the ingredients for the sauce in a medium pan. Bring to the boil before lowering the heat and simmer for 15-20 minutes, until the liquid reduced in half, to about 300 ml. To assemble, arrange the pork, skin side down, in 1 or 2 rows in a medium sized shallow heatproof dish. Spread the mustard greens over and around the pork. Pour over the reduced sauce. Prepare the steamer. Line the lid of the steamer with a clean kitchen towel to absorb any condensation, this will dilute the sauce too much. Steam for anything between 4-6 hours until the pork is tender. Top up the steamer with more boiling water whenever it start to look like it's drying up. Carefully remove from steamer. Set a large serving plate over the dish. Holding both tightly over the sink and quickly invert the dish to transfer the preserved mustard greens and pork onto the plate. Serves with plenty of hot steaming rice. Note: If you prefer a thicker sauce, drain the sauce onto a pan and reduce slightly over high heat. Pour the thickened sauce over the finished dish before serving. 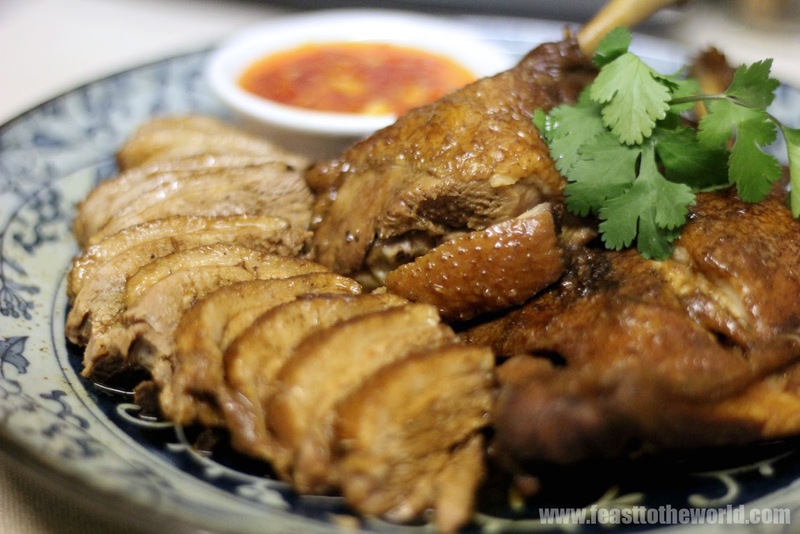 There is something strangely comforting about Teochew braised duck. Nothing soothes a weary soul like taking a whiff of this as you lift up the lid of an on going simmering duck, slow braised in earthy aromatic spices which just exude a gratifying aroma, like a warm steamy hug. It's the ultimate Singaporean home comfort food. Duck may not the healthiest poultry of choice due to it's astoundingly high fat content but the slow cooking process actually helps to render out any excess fat. These floating oily layer can then be easily scoop out and discard to reduce the fattiness. The duck also develops rich, robust flavours after hours of submerging in a simmering stock made of soy sauce and spices yielding some warm and buttery soft meat. It is best to start the prep a day ahead as you will need to thoroughly rubbed the duck with the spices and salt and allow it to have a good chance to permeate the flesh before braising it. Although it might sounds a bit tedious having to plan this a day in advance but don't be tempted to skip this step as it really does make a huge difference. Do not discard the leftover braising liquid. I always keep a batch frozen in my freezer to be added to any future braising duck, chicken, pork etc. This will intensified with each cooking sessions and what you are left with is a more complex and rich stock, resulting in even more flavoursome braised meat. This master stock, as it is commonly known, is the true secret behind all the good Chinese restaurant, where some master stock are passed down through generations and can be hundred of years old! On the day that I cooked this, I foolishly forgotten to cook the rice. So out of sheer desperation, I nipped down to my local Chinese supermarket, which thankfully is only a stone throw away, bought a packet of flat wanton noodles and some chinese greens, choy sum. I quickly blanched the vegetables and noodles for 30 seconds in boiling water. Drain and plated onto a serving dish. Topped with the carved duck and some of the delicious thick braising liquid. Scattered on some fried shallots and chopped coriander for garnish. Lastly, a dollop of chilli sauce and a few drops of sesame oil and voila! 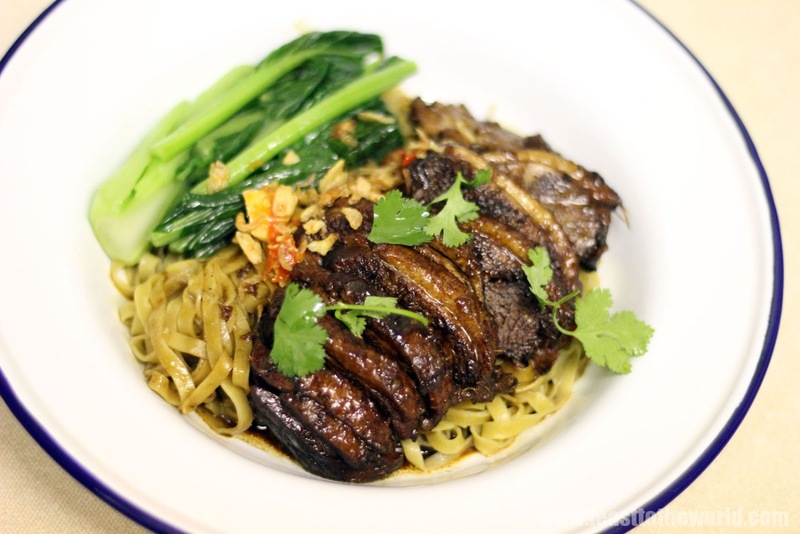 Teochew braised duck noodles. Note to self: Next time, remember to cook the bloody rice. Prep the duck a day before cooking. Rub the duck well with the dark soy sauce, sea salt and five-spice powder until it is well coated. Cover and set aside to marinade in a fridge overnight. Remove the duck from the fridge an hour before cooking and allow it to come to room temperature. 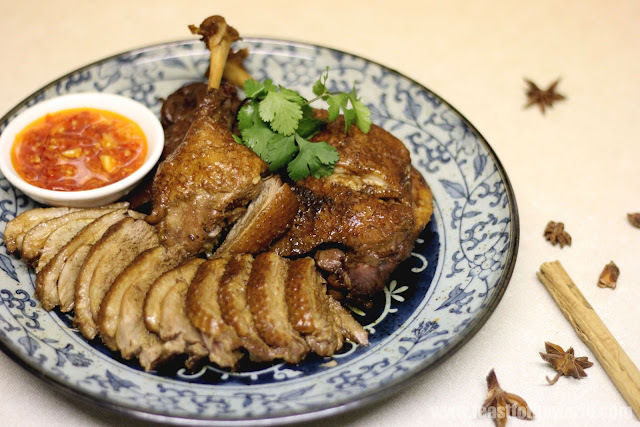 Heat the oil over a medium heat in a wok or pan large enough to accommodate the duck. Stir fry the shallots and garlic for 2-3 minutes, until fragrant. Add the cinnamon, ginger and galangal and continue to fry for another minute before adding the seasoning ingredients. Place the duck in the wok/pan, breast side up. The duck should be fully submerged in the liquid. Bring the liquid to a simmer. Cover with a lid and simmer for 1 1/2 - 2 hours, until the duck is thoroughly cooked and tender. Meanwhile, prepare the chilli dipping sauce. Finely chopped the chillies and garlic in a food processor. In a bowl, mix the sugar with the vinegar until dissolved. Add the chopped chilies and garlic and mix well. Set aside. Remove the duck and turn up the heat to reduce the braising liquid slightly while you chopped up the duck into serving pieces. Transfer onto a serving dish, ladles over some of the reduced liquid and serve hot with some steamed rice and Teochew chilli dipping sauce. Over the period of Chinese New Year, a delicate and crunchy raw fish salad Yu Sheng 鱼生 is enjoyed by almost everyone in Singapore, none more so than on the seventh day of the New Year, commonly known as everyone's birthday, ren ri 人日. This salad relies heavily on the balance of all the ingredients as sometimes, up to 20 ingredients are used to create this. Each component is picked either for their colour or their auspicious meaning. 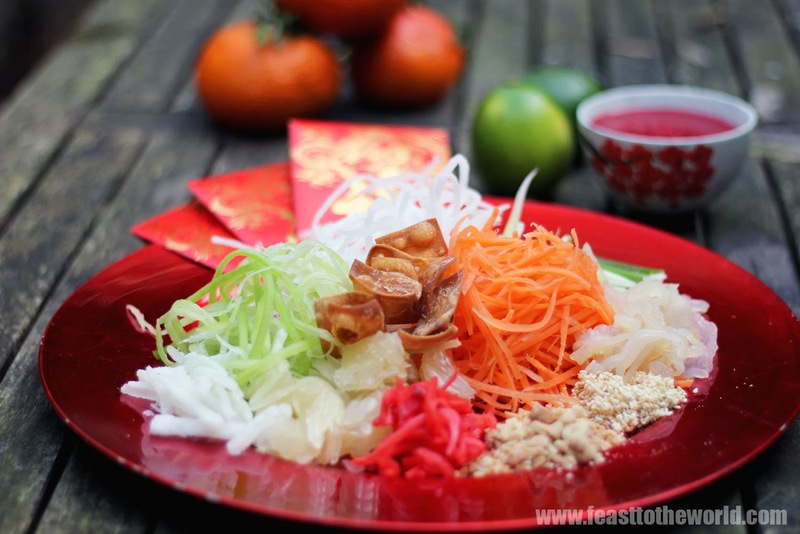 A usual mixture will include raw fish - traditionally wolf herring but salmon is very much the norm these days, finely julienne vegetables, candied melon, toasted peanuts, sesame seeds, pickled ginger, pomelo, jellyfish and limes. These are then tossed just before serving in a sweet-tangy plum sauce dressing. The tossing of this beautiful multi-coloured salad is what makes this a very special occasion indeed. It must be done standing up as this mammoth task is impossible to action sitting down and where is the fun in that. 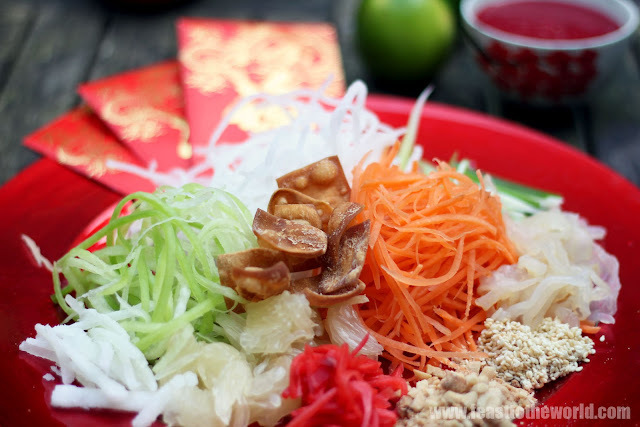 Using long chopsticks to raise the salad high or lo hei 捞起 signified stirring up luck and prosperity. The higher you toss, the better your fortune for the year will be. Don't worry about creating a mess as this means fortune scattered everywhere (so make sure you make as much mess as possible on your end to ensure you get all the good fortune). Another common practice is to shout out well wishes such as nian nian you yu (to have abundance of), bu bu gao sheng (to be successful), jin yu man tang (gold and gems filling the house), and so on and so forth. And since we are still within the fifteen days of Chinese New Year......go on, have yourself a toss and may this bring you wealth and prosperity. To prepare the sauce. Place the plum, water, honer or maple syrup, lemon juice into a food processor and blitz until smooth. Pour the puree into a pan, add the salt and sugar and bring to a bil. Lower the heat and simmer for 5 minutes. Taste for seasoning and add more sugar if it is too tart. Strain the sauce into a bowel and set aside ti cool completely. Prepared the vegetables. 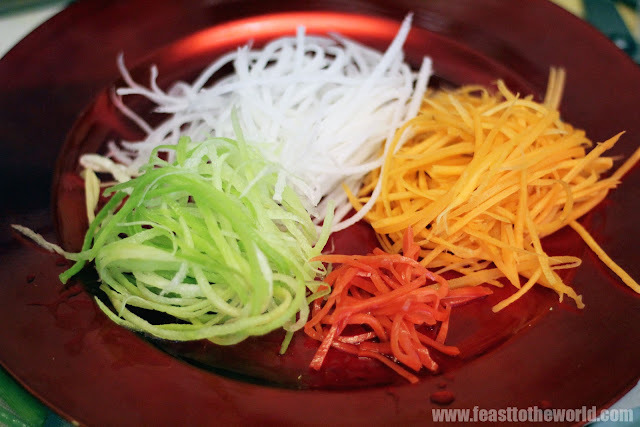 Peel the daikon and carrot and cut into fine julienne strands. Soaks the strands in cold water for 10 minutes to refresh them. Drain and dry thoroughly with clean tea towel. Prep the seafood. Wrap the fish in clingfilm and freeze for 20 minute to firm up before slicing them across the grain thinly. For the crispy dough flakes. Heat some oil in a pan to 190ºC and fry the wanton squares for 30 seconds. Remove immediate once they start turning golden and drain on some kitchen paper. 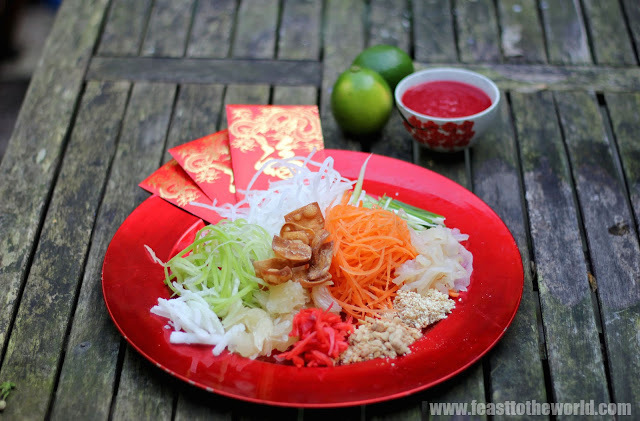 Assemble the yu sheng. Mould the carrot and daikon onto a large serving plate. 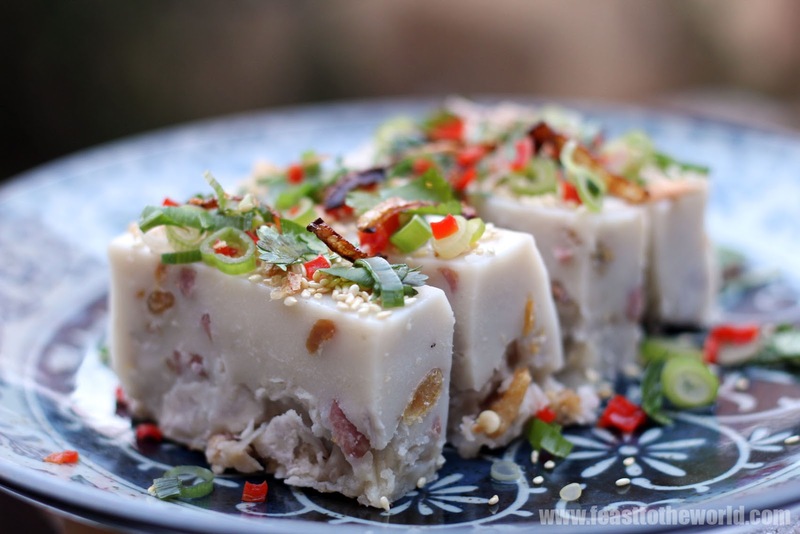 Arrange the rest of the items such as pomelo, spring onion, fish slices, jelly fish, pickled ginger etc in small moulds around the plate. 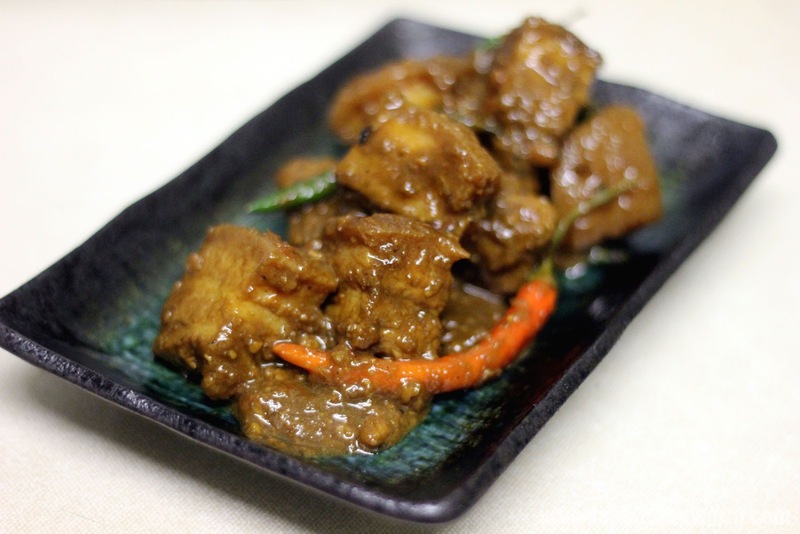 Place the plum sauce, groundnut oil, lime in their own dish on the table. Fill the angbao with ground cinnamon and white pepper. To serve, empty the cinnamon and white pepper onto the salad, follow by squeezing over the lime. Drizzle with the oil and plum sauce (you don't have to use them all) and now get tossing. Mix thoroughly before serving a small portion to every diner. Sometime I think the world is unfair. Why does pancake day always falls on a Tuesday? Uhm...before you start, that was the rhetorical question. The last thing I need right now is a lecture on the fact behind this tragic arrangement. Does the world not realised that there are people like me who get up early in the morning for work? And when I say early, I meant at 5.30 in the morning. At that time in the morning, the last thing on my mind will be sifting flour and making my pancake batter, let alone flipping it. I simply do not have the time! But yet, I do love pancakes and that poses a perpetual dilemma. Cold pancakes are never really that nice, so prepping them the day before is completely out of the question. It is at times like these that I wish we have a well equipped kitchen in the office. But no...oh no! All we have are some run down industrial microwaves which are fine if you want to zap up your packed lunch (mmm...something smells burnt) but try making pancakes using these (now that's an idea) is almost impossible. Believe me, I've tried. And any attempt in reheating pre-made pancakes in these microwaves will simply result in pancakes so chewy that you will still be working you way through them come Easter time. 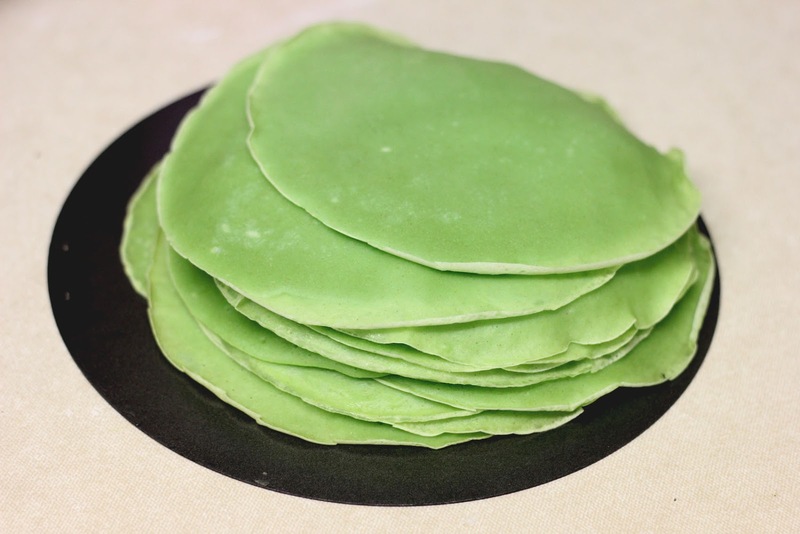 So the next best thing is......my nan's secret weapon - Nyonya Kueh Dadar (also known as Kueh Ketayap). At first glance it might not look like your conventional pancakes but on closer inspection, all the usual suspects that make great pancakes are there. You have deliciously light pancakes which you made by flipping (mind the ceiling!) - Tick! 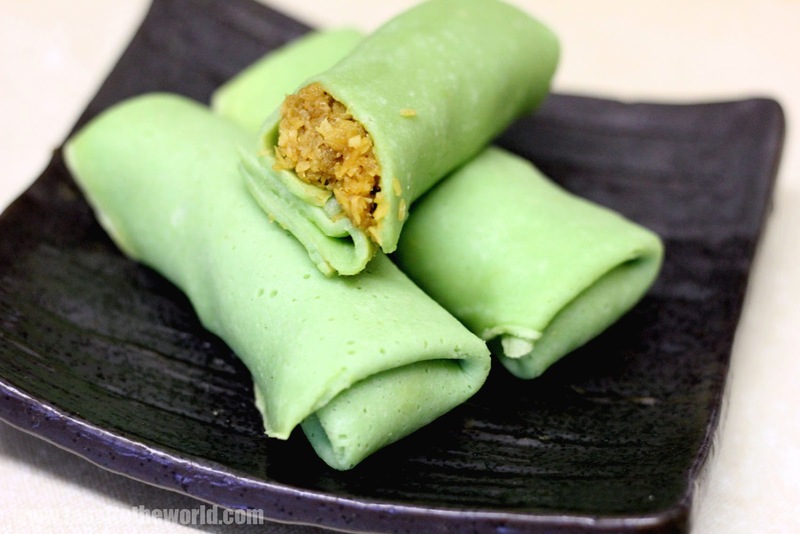 Sugary syrup in the form of the palm sugar infused grated/dessicated coconut filling - Tick! Tick! And last but not least, this can be made in advance and eaten cold the following day - Tick! Tick! Tick! Well, I'm not sure about you, pancakes or no pancakes, this is it! Give it a go.....you know you want to. See also my Apom Balik (Gula Melaka pancakes with sweet banana caramel sauce) for another great alternative. Place the gula melaka, sugar, coconut milk and knotted pandan leaves in a pan slowly bring to the boil. Simmer for 5 minutes, until the sugars dissolve. Turn off the heat and add the desiccated coconut. Toss to mix well. Leave to cool before discarding the pandan leaves. Set this aside for at least 1 hour or preferable overnight so the coconut can absorb all the liquid and turn into moist clumps. 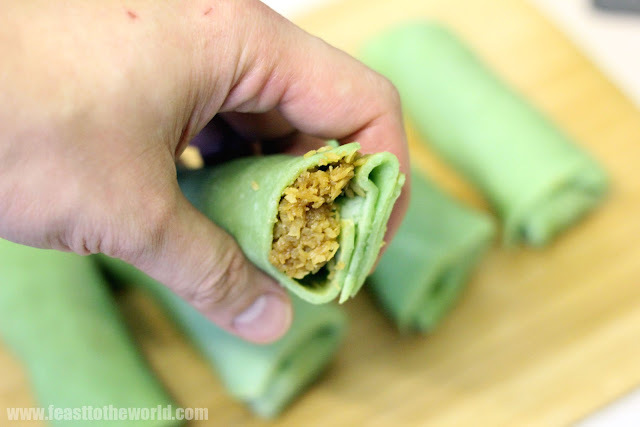 For the pandan liquid, blitz the pandan leaves and water in a blender. Pass through a sieve to remove pandan fibres. Set aside. Sift the flour into a large mixing bowl. 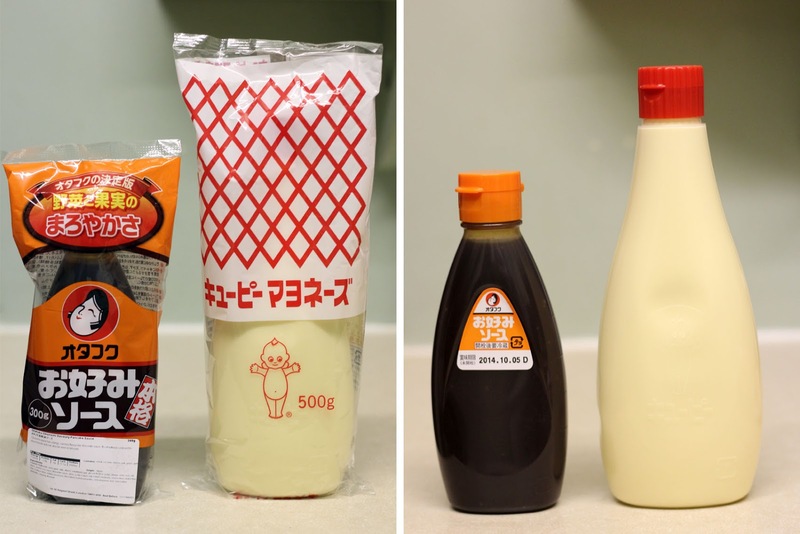 Mix in the tapioca flour, sugar and salt. 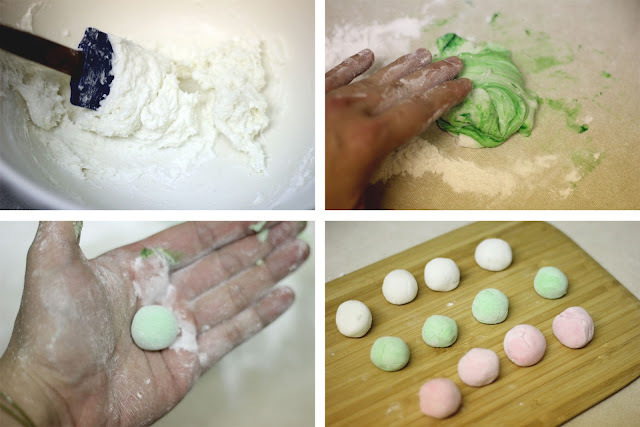 Make a well in the centre and whisk in the eggs, a little at a time, before pouring in the coconut milk, pandan liquid and green colouring, if using. Whisk to a smooth batter. Rest the batter for 30 minutes before frying. To prepare the pancakes, heat a nonstick frying pan, about 20cm in diameter, over medium-low heat. Pour in a ladleful of batter and tilt the pan or using a spatula to spread out the batter thinly across the pan. Once tiny craters start forming on the surface, flip the pancake over and cook for a 30 second, until cook through. Remove from the pan and repeat with the rest of the batter. To roll the kueh dadar, lay a pancake on a work surface. 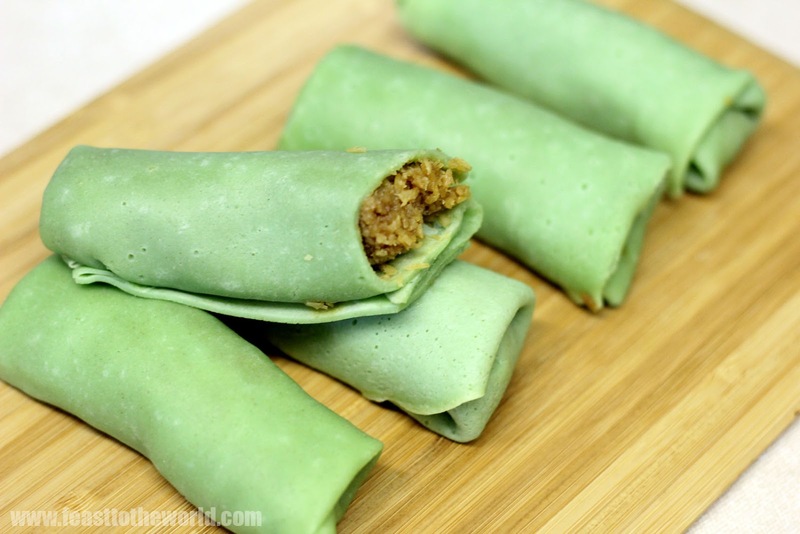 Fill the middle with 1-2 tablespoon of the filling. 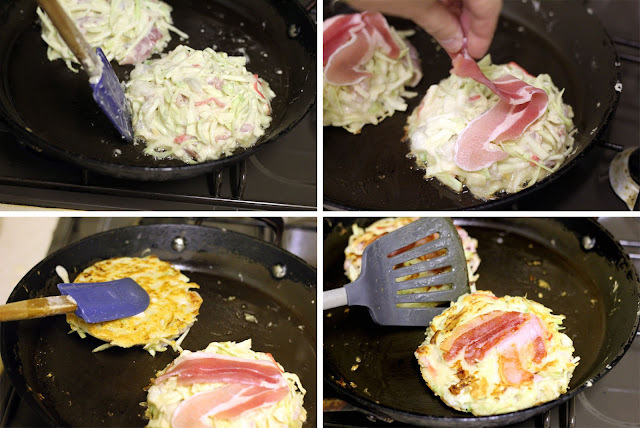 Fold the lower half of the pancake over, the fold the left side over , then the right. Roll up to form a cigar shape. (see pics below). Repeat with the rest of the pancakes and filling. Serve preferably on the day but this will also keep, if wrap well, for a day or two. Just a very quick post from me before I proceed with my reunion dinner, like all good Chinese across the world. Yes, it is the eve of the Chinese Lunar New Year, which is to a lot of Chinese, more important than the actual day itself. For this is the evening when we would normally travel for miles to be back to be with our families and loved ones. It is this meal that celebrate the family reunion and togetherness. Lots of delicious fare will be prepared and every member of the family would sit round the table to enjoy the well earned dinner. 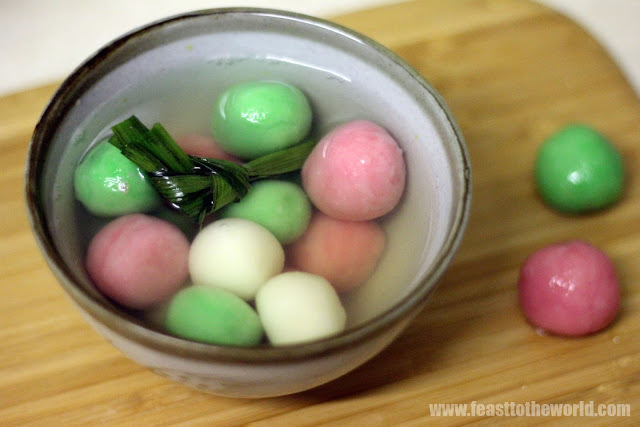 One of the most symbolic dish will be this glutinous rice ball, known as Tang Yuan 汤圆. This round dumplings is traditionally served as pudding at the end of a reunion meal to celebrate this togetherness of the family. Like the shape of the dumplings and the round bowls that they are usually served in, they represent 'complete' and 'wholesome' which is what the evening is all about. Tang Yuan can either be filled with chopped peanuts or sweet red bean paste but for the traditionalist, the plain ones, served in a sugary ginger syrup are the best. red and green edible food colouring, or any of your choice but the auspicious red is a must! Combine the pandan leaves, ginger, water and rock sugar in a pan. Cover and bring to the boil, then lower the heat and simmer for 15-20 minutes. Adjust the sweetness to taste and strain. Sift the glutinous rice flour into a large mixing bowl. Pour in the boiling water and stir with a wooden spoon or spatula to mix until you get a crumbly dough. Add the oil and knead the dough with damp hands to bring the dough together. Cover the bowl with a damp tea towel and allow the dough to rest for 20 minutes. Divide the dough into 3 portions. Add a few drop of red colouring to one and knead to mix in the colour. Repeat with the green and leave the last portion as it is. Dust your hands and pinch off a bit of dough and roll using your hand into a round ball, the size of a grape. They will expand when cooked so make sure they are not too big to begin with. Repeat with the remaining dough. Bring a large pan of water to the boil. Keep it on a simmer while gently dropping the dumplings in. Do this in batches and do not overcrowd the pan. Tang yuan is cooked when they float to the surface. Scoop them out with a slotted spoon and transfer them to a large bowl of fresh cold water while you continue with the rest. To serve, heat up the pandan and ginger broth. 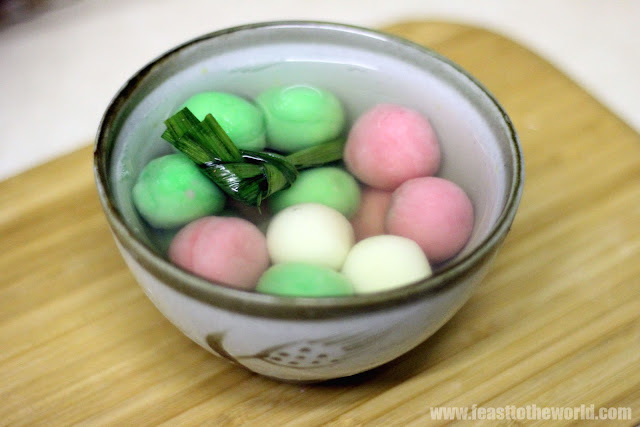 Drain and scoop the tang yuan into individual serving bowls and ladle in the broth. Why are pigs so damn delicious and yet they get so much sticks for being just what they are - Lazy? 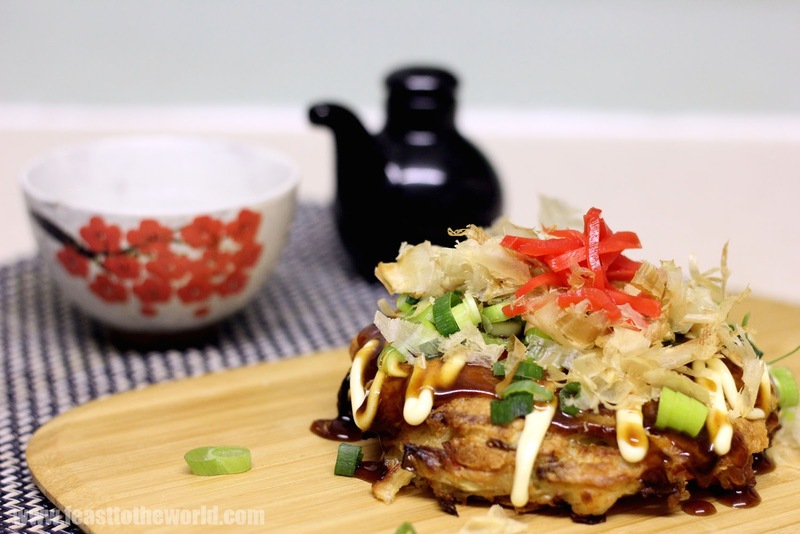 Lack of exercise and intense workout resulted in high fat content, in turn develop into a brimful of umami and that makes them very special and flavoursome indeed. Without the fat, there will be none of those much sort after cracklings, so delicious that the very mention of this crispy treats will lit up the eyes of any pork-lover around and send them into a feeding frenzy, think a-drop-of-blood-in-an-ocean-full-of-piranhas or the-first-day-of-boxing-day-sale and you'll get the drift. Madness, sheer madness! We Peranakan have an firm affinity for all things porky. We love the swine so much we jump at every opportunities there are to include them in most of our meals. Take fore instance the Buddha's Delight. 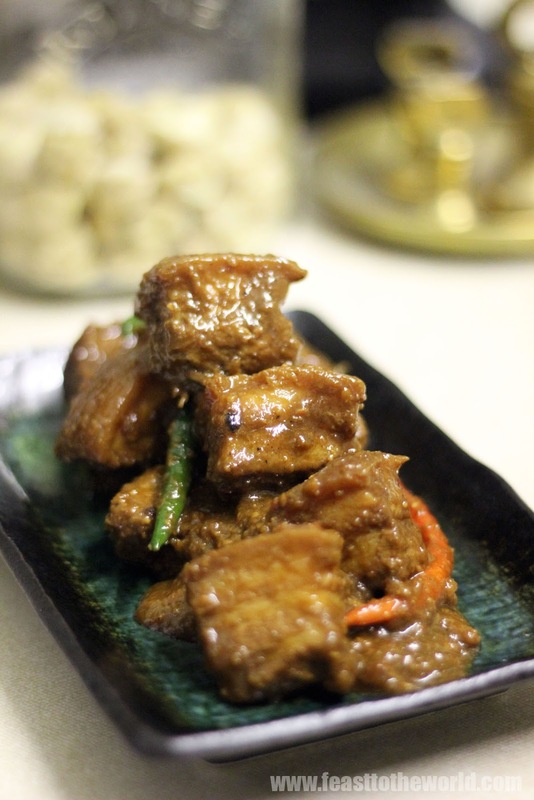 Traditionally a Chinese vegetarian dish treasured by the Buddhist monks but in the hands of a Nyonya, get a complete makeover into a pork-rich Chap Chye, no more plain old boring vegetable dish. 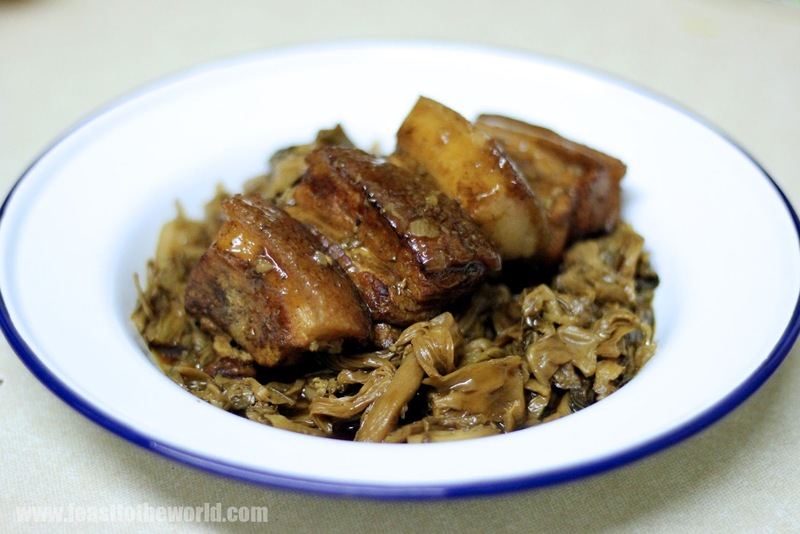 And then there is this, Babi Assam, which take the majestic fat-ladden pork belly, throw in some tangy tamarind and slow braised for hours and hours until soft and tender. 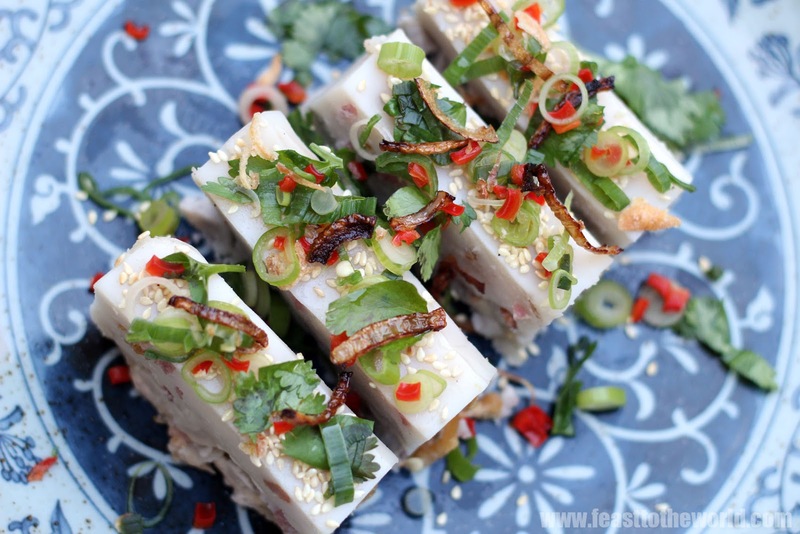 I have made this with pork cheeks before and it taste equally delicious but to me, the flavours from the layers of fat in pork belly is second to none. 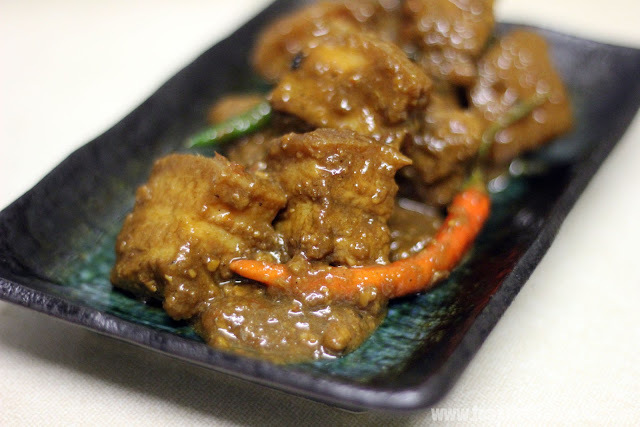 Just like many Nonya braised dishes such as Babi Pongteh and Beef Rendang, this just get better with age and I will definitely encourage you to make this at least a couple of days in advance. Stored it in the fridge and then reheat for a rich, delicious supper which is what I did at my recent supperclub. Needless to day, it was very well received and the crowd loved it. A perfect dish for a wintry night. Using a mortar and pestle, pound all the ingredient for the rempah/spice paste into a fine paste. Alternatively, blitz the ingredients in a food processor. Bring a large pan of water to the boil and lightly blanch the pork belly pieces. Drain and rinse thoroughly with cold water. Heat the oil in a wok or large pan over medium heat. Stir fry the rempah for 5-6 minutes, until fragrant. Add the preserved soy bean paste and cook for another minute before adding the blanched pork belly and lemongrass. 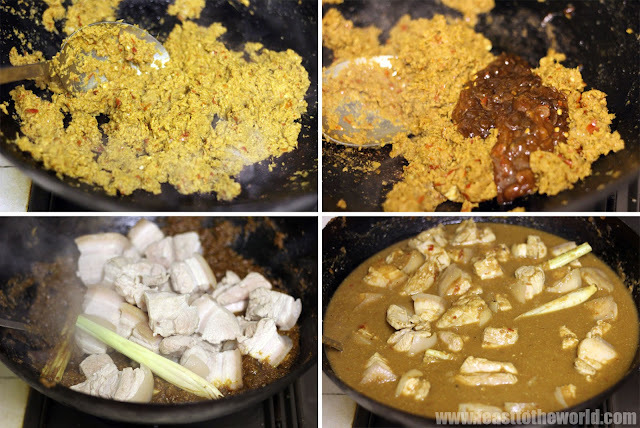 Stir to coat the pork pieces with the spices before adding the gula Melaka and water and bring to the boil. Place the lid on, lower the heat and gently simmer for at least 2 hours (or 10 hours if like me, you have the time. The longer you cook it for, the more tender it will become), until the pork is tender and the sauce have reduced and thickened. Add a touch more water if it start to look too dry. Season with salt to taste. Transfer to a serving dish and serve hot, garnished with the green and red chillies.